THE QUESTION REMAINS – IS OUR CHILDREN LEARNING? Did everyone remember to set their clocks back an hour? Remember, it’s that time of year where we “fall back” into fall! Ugh. It’d been a while since I had done one of these. I thought it would be funny to do something a little more random – especially since I could think of nothing to spoof. I didn’t get a chance to see Scary Movie 3 this weekend, but I guess the producers aren’t missing my absence. Did you hear this movie pulled in nearly $50 million this weekend? That’s a pretty obscene amount of money for a toss-off film like this one. For what it’s worth, I don’t think they’re lining up around the block for Eddie Griffin. I was able to sneak in watching both Cube and Identity this weekend – two films I rented last Sunday and needed to put away before I got caught in a situation similar to the second panel of today’s comic. I thought Cube was an interesting premise, but a little thin on plot to stretch out over the span of a feature-length movie. There’s a lot of math in this movie, too. This is usually a turn off for me (re: A Beautiful Mind). But with all the calculations of prime numbers and permutations, I found myself intrigued. I also liked the “Big Brother is a vapor” overtones of the movie and the suggestion that the creation of the cube was essentially the work of idle hands. Apparently there is a sequel to Cube called Hypercube and it takes place in another six-sided deathtrap that introduces the 4th dimension into its catalog of lethal traps. Sounds complicated. I guess they’re working on a prequel to the series called Cube-Zero, which explains the origins of the cube. Bad idea. Half the fun of the original was just trying to figure out what the hell is going on! Identity was a good flick. It had a very fun twist at the end. Not as violent or scary as I thought. It was really more suspenseful – a good mystery. The ending wraps things up fairly quickly, but it’s a fun ride. If you like John Cusack in the rain, this movie features him dry in maybe one or two scenes. I forgot to mention last week that Jared and I watched a bootleg copy of the Japanese film Battle Royale. He picked up his copy at the Minnesota FallCon we attended not long ago. What a screwed up movie. I guess the popular myth is that this film was banned in America due to its extreme violence and residual Columbine wariness due to the film’s concept – kids killing kids on a deserted island until only one is left. In truth, the production company, Toei, refuses to license the movie for North American distribution and has already rejected offers from several North American companies. Thanks, Toei. The movie’s violence really isn’t that shocking. Well, at least it’s not any more graphic than anything you would see in Kill Bill. I think what’s disturbing about it is trying to figure out how you would react in that situation. Would you try to survive? Would you freak out and commit suicide like some of the students in the film? What are your odds of making it? It’s like looking at a room of your friends and trying to figure out if you could take them in a fight. Anyway, that’s been my movie-watching schedule as of late. Say, have you noticed Theater Hopper’s latest feature – The Walk of Fame? It’s a brand new donation system I devised that will allow those of you with PayPal access and opportunity to help support the site, while immortalizing you name for all to see. The concept is simple. Donate to the site any amount you think is fair. It could be a dollar. It could be twenty dollars. Once I receive your donation, I place your name on The Walk of Fame! Exclusive content like wallpaper or portraits commissioned in the Theater Hopper style are possibilities for the future. But for now, you can feel confident that your donation will help Theater Hopper operating in the face of a growing need for bandwidth and fending off the cost of hosting. Certainly you aren’t obligated to donate, but if you can find it in your heart to do so, it would be most appreciated! Thanks to everyone who continues to support Theater Hopper. I haven’t stopped to take stock of how lucky I am in a little while. I’m still amazed that you guys keep coming back here week after week and I appreciate it. Again, thanks. And don’t forget to vote for Theater Hopper at buzzComix! 5) R2-D2’s Acrobatics – Most awesome, but it left we wondering why didn’t he use any of those skills in IV, V, or VI. This one is forgiveable though, because of the height of the X-Wings compared to the ships in III and the fact that R2 has always done enough to save himself and others. Why show off if it isn’t needed? Though Yoda and Obi Wan’s age progression explains the reason they are less acrobatic, this one is less obvious. 4) Dialogue – I am lying a little here, because the dialogue didn’t bother me that much. Some of the catch phrases stood out a little too much maybe, with the actors practically winking at the camera during the lines “I have a bad feeling about this!” but again, forgivable. The dialogue was fairly in league with the rest of the series. 3) Acting – Improved from Episode II. Still not great in many aspects, with the exceptions Tom mentioned above. 2) and 1) Blown Secrets – Okay, now for what really bothered me and the reason I am posting today. The last fifteen minutes of the movie blew at least two secrets from the original trilogy. Episode III seems to assume that everyone has seen IV, V, and VI. Of course, today, most people have. But future generations watching the films in numerical order are going to think that IV, V, and VI are lame because Episode III: Blew the secret that #2) Vader is the Father of Luke and #1) Luke and Leia are twin siblings. I think this would have been best left shrouded in mystery – We could have heard a baby crying and fans would know without having two of the bigger plot revelations screwed up. Plus, couldn’t at least one of the Jedi sense the twins? Maybe that is getting too personal? Mar 26, 2007 CAN SOMEONE PLEASE TELL ME WHY I READ EW? Wednesday is my last day here in Chicago while I am undergoing training in ActionScript for my 9 to 5 job. As such, I had to call in the big guns to provide some support. 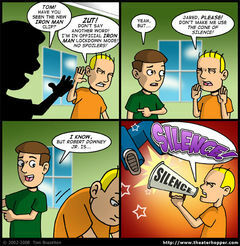 Today’s guest strip is courtesy of my good friend Mighty Joe Dunn! If you don’t know Joe’s work, you’re living under a rock. To shine a little light under that rock, I strongly advise you to visit Joe Loves Crappy Movies. I love this strip. Joe was a little self-conscious about it when he sent it to me because it wasn’t in color and not up to the standard that he usually holds himself accountable toward. But I told him not to sweat it. I thought the joke was great and I love the multi-panel approach. You have to keep this in context, folks. I dropped my guest comic request on Joe at the 11th hour just as he had one foot out the door to attend the Small Press Expo that was going on in Bethesda, Maryland last weekend. He got this strip done while he was on the convention floor. Giving up his valuable time when he could have been making mad money. So, more than a tip of the hat to Joe. The man is awesome. Period. If you’re a fan of The Triple Feature – the weekly talkcast that Joe, myself and our friend Gordon McAlpin run every Monday night – you might have noticed we were out of commission yesterday. Notorious TalkShoe “technical difficulties” got in the way and we had to scrap the show. The deck was kind of stacked against us to begin with. Joe was going to log in as me since I was without an internet connection and then Gordon and I were going to call in from my hotel room. Y’see, Gordon lives in the Chicagoland area and swung by after work to hang out. Due to no fault of our own, the show failed to materialize, so we had to abandon it. We’ll be back next week to talk more movies with you! Speaking of movie talk, did you guys get a chance to check out my DVD review for Planet Terror? I posted it yesterday. You should read it. I’m going to post another review tomorrow. One for Transformers. So be sure to check that out as well. It’ll probably be another mailing list giveaway like I did with Evan Almighty last week. Mailing list message go out every Friday, so if you want a chance to win this action figure, sign up now! Something else happening Friday – I have some important site-related news I want to share with all of you, but I have to hold off until Friday until things settle down a bit. There is a subtle change behind-the-scenes that I think will improve what I’m doing on the site that I want to talk about. It’s kind of a long-winded deal and I want to wait until I’m back home and in my routine again before I talk about it. Have a great day and be sure to visit the site again tomorrow! I know that I did a comic about Zombieland last Monday. But since I had an opportunity to actually see the film on Wednesday, I had to do another comic about it today. Y’see, what’s depicted in today’s comic is based on real events. Allow me to explain. I went to a 12:30 showing of Zombieland on Wednesday and I was the only guy in the theater except for one other dude that was sitting in front of me. I’m not a big fan of zombie movies. I don’t like gore and I don’t like cheap “GOTCHA!” scare tactics. So I busted out my iPhone and started updating to my Twitter account to distract me from some of the carnage on screen and the anxiety that was building up inside of me as I waited for the next zombie attack. This is not normally something I would do during a movie. But, like I said, I was having anxiety attacks and there was only one other guy in the theater with me. If you take the long view, Zombieland isn’t all that gory or scary. At least not after the first act. Once it gets it out of its system, the film makes room for more pop culture zingers and character development. At any rate, something happens in the second act that I thought was AMAZING and I tweeted about it – generally lamenting that I wasn’t watching the film with a larger audience because it would have been neat to see their reaction. Checking my phone maybe 15 minutes later, I saw a bunch of reply tweets from people like Gordon McAlping Multiplex and Paul Southworth from Not Invented Here having a conniption fit because what I tweeted about was apparently spoiler material. Now, in my defense, I had read a few reviews of Zombieland and was already aware of this spoiler, so I didn’t think I had done anything wrong by mentioning it. But as more and more people began to reply with sarcastically toned “Thanks a lot, Tom!” tweets, I knew I had stepped in it. I made reparations quickly. I deleted the offending tweet and asked forgiveness. Shortly thereafter, people started to pack away their torches and pitchforks. 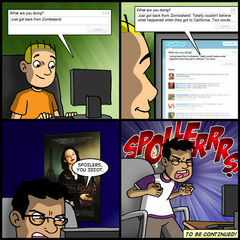 Now, you know me… I’m not exactly the guy known for flinching when it comes to giving away spoilers. But I genuinely felt bad about this one because a.) the movie has been in theaters less than a week and b.) the event I got so excited about is so thoroughly awesome, I really, really, REALLY want people to check out Zombieland to experience it on their own. Obviously, I won’t go into any more details than that. So I STRONGLY encourage you to see Zombieland if you already haven’t and – if you go – don’t do what I do. Don’t see it by yourself. Take a bunch of friends and see it with a large audience. Because I have a sneaking suspicion the movie will pay dividends if you do. By the way, be sure to stay through the credits for an extra scene. You won’t regret it. So, as I have now deftly danced through my explanation of today’s comic, I plan on using my faux pas as inspiration for a short storyline! As you can see, there is the tiny “To Be Continued…” disclaimer at the end of today’s strip and I think you’ll like where things are going. I hope Gordon doesn’t mind his unauthorized cameo, but I’m sure if you visit his excellent comic Multiplex, he will forgive me. Be sure to contribute to his fund raising efforts to put together the first print collection of Multiplex, too! That’s all I have for today. Be sure to check us out on Monday for the continuation of the story line! So here’s the follow up to the cliffhanger I left you with on Friday – the continuation of Tom’s misadventures after sharing spoiler information about Zombieland on Twitter. Friday’s comic was based on real-events. Things from this point on are entirely fictional. I felt compelled to share that just in case anyone was confused. 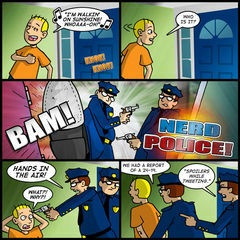 In case you happen to be new to the site, this isn’t the first time the Nerd Police have slapped the irons on Tom. Their first appearance was WAAAAYYYY back in 2005 when Jared rats him out for confusing Hitchhiker’s Guide to The Galaxy with Doctor Who. Much hilarity ensues. I had been looking for an excuse to bring the Nerd Police back, even though the characters undergo no development in any way, shape or form. They’re just a couple of nameless thugs with horn rim glasses and I like ’em that way! The concept is funny, at least. Well, funny to me, I guess. Anyway, not much else to talk about with this comic except to say stay tuned for Wednesday’s comic and watch where the story line goes. We took last week off after my hard drive crashed and Gordon had a biopsy taken off his tongue which left 5 stitches in his mouth. Good times! But this week I know we’ll at least be talking about Zombieland and probably more. Also, I know that Joe just got back from Baltimore Comic Con this weekend, so maybe he has some stories to share about that. So be there to listen LIVE at 9PM CST. Participate in the live chat, ask us questions and even get on air with us (if you are so inclined.) We hope to see you there! 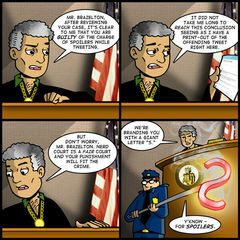 It seemed appropriate to me that punishments handed down in Nerd Court would be medieval in nature. Not just for the obvious Dungeons and Dragons connection. But have you ever seen a nerd in a position of power meter out justice? It’s brutal. Call it reparations for a youth spent on the receiving end of a hundred locker room swirlies. That’s pretty much the end of this little story arc. That is, unless I can figure out a way to make Tom’s new scar fit into the comic somehow. If not, I hope you enjoyed the arc. I know I mentioned on Wednesday that I was going to videotape my interview on The JG Faux Show from Wednesday night. I have footage, but it’s kind of from the back of the room and a little bit obscured. I heard from the show organizers that they bought a Flip camera to record the show and that they would put their video online soon. They’re camera was right up front, so it’s probably a little bit better of a vantage point. Apparently I am the first guest they’ve had that they’ve recorded. I’ll let you know when it shows up online. As for the interview itself, I thought it went really well! I have to give these guys credit. They did a good job of researching me and putting embarrassing pictures of myself up on the wall behind me, beamed from a large overhead projector. These were all pictures that I uploaded to MySpace or Facebook or whatever, so I really have no one to blame but myself. It wasn’t that embarrassing, actually. But the experience kind of tears down the veil between you and your audience. I mean, you upload pictures to these social networking sites and it feels kind of like a one-sided affair. But when there is a room full of people looking at these pictures together in real time, it kind of brings it full circle. I guess I’m finding the experience hard to explain. I don’t mean to focus on that, though. I had a great time during the interview and would love to go back someday. Cami was in the audience (and manning our video camera) and after it was over, said that she was very proud of me and that I did a very good job holding my own with the interviewer and making it entertaining. So, long story short, I didn’t embarrass my wife in public. MISSION ACCOMPLISHED! I don’t know if I have much more to share. Hopefully Cami and I can find an opportunity to see Where The Wild Things Are this weekend, but we’re having trouble lining up a babysitter for Henry. I’ll be a little bit bummed if I miss it, but a calm weekend at home doesn’t sound bad to me, either. I hope things are well on your end and I’ll see you here again on Monday!